Everyone loves white sneakers, Right? They have immensely made their way from all your workouts to weekends and now they are in every man's closet. 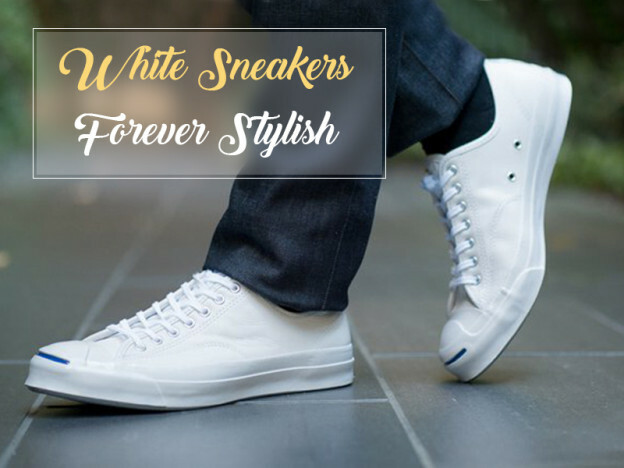 Sneakers are always in trend but nowadays white sneakers have stolen all the limelight. We already know that white shoes have always been a style weapon, Classy, versatile and simple to style. It's considered as men's style essential so it has to be in your wardrobe. White sneakers have a tendency to exalt any clothing – shorts and jeans, obviously, but if you choose them well it also ennobles a sharply cut suit without any doubt. Yes definitely, you can style your white sneakers with a suit. Read our blog for more information regarding styling this versatile combination. It doesn't matter that how many times you have worn them, they can still make you look modern and young if styled correctly. You can pair white sneakers with a casual outfit preferably in a contrasting color. The design of your white sneaker may be sober and low, but it will make a great impact when you wear them perfectly. Pair your white soldier with black leather jacket, crisp plain white T-shirt and dark denim for a stunning look. For a hip-hop style wear skinny jeans, check shirt and obviously your sneakers. Your favorite charcoal suit with white sneakers and a trilby hat. Keep yourself warm in winters with jacket and jumper. Roll up your jeans with your sneakers. And you are ready to make a style statement even in the winters. If you haven't bought one yet, you must! On That Note: Gentleman, give your formal shoes a break this season and style with a new version.